Congratulations to the 2011 National Champions! 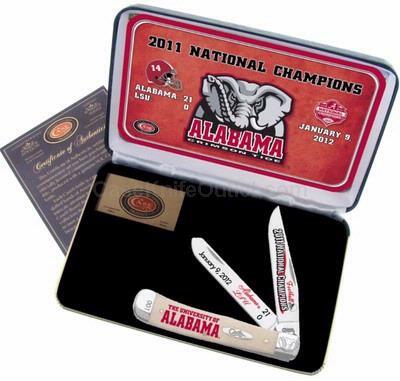 In honor of the 2011 National Champion Alabama Football team, we are happy to offer this officially licensed Case collectable Natural Bone Trapper with embellished blades, bolster, and handle. Each knife is packaged in a leatherette display case and includes a certificate of authenticity. This is an officially Licensed Alabama Crimson Tide Football item. As with all natural material color and texture may vary. Made in the USA.